﻿ Tikal Knowledge - Install Membase 1.6.5.3 on Amazon EC2 and configure it on EBS. 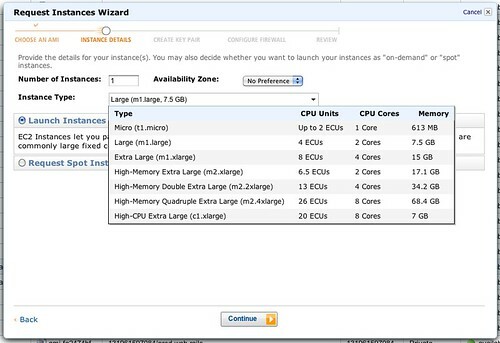 Install Membase 1.6.5.3 on Amazon EC2 and configure it on EBS. As your application grows (like ours did) you will need more space to store your cache. In our case, we needed to move from memcached to membase and make use of both memory and disk space. The decision was made and we decided to go with a 2 server solution, each server has 16G of memory and 100G of EBS volume attached to it. Also, both will have membase latest stable version installed and perform as a cluster in case one falls or anything happens, a fail safe if you will. In this post, I will walk you though what was done to perform this and how exactly it was done on the amazon cloud. First things first, select an AMI from your list and click on “Launch instance”. You will see a dialog popup where you need to select the instance type. I selected the 16G memory server, I launched 2 instances from this type. Like I said before, I wanted those to perform in a cluster so I will have a fail safe option. Now, you have 2 servers up and running. Because those servers are serving as a membase solution to production servers, I also configured an elastic IP to them. Now, let’s create our volumes. Go to the EBS section and click on create volume (top right in this image). Just select how many Gigs you want, availability zone (make sure it’s the same as the server availability zone or you will have performance issues). 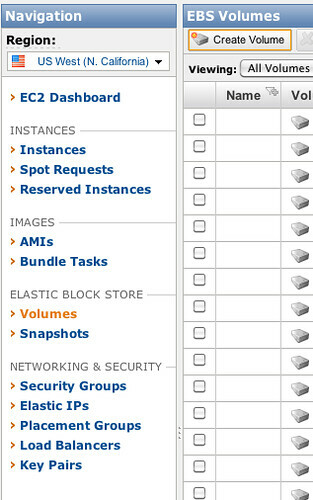 Once the EBS volumes (I needed 2) are ready, all you need is to attach those to your servers. OK, so now we have our servers and volumes attached to them (instances don’t “know” the EBS’s yet). After you ssh into your instance run these commands to have your volume installed on the instance (You can mount in another folder and not the one I selected here). This will mount the EBS to the /mnt/data-store folder, which we will use in a few minutes to have membase work on this folder and not steal space from the server main disk (which will result in a crash). Now, go to membase.com, register for the download and you will be able to download the package you need, you can select from a variety of versions. Copy the download link and go back to your server. Put this in your shell and click ‘Enter’. I have a server with RPM but it’s all the same with another package manager. Now you have membase installed on the server. Congrats! All should be running now. 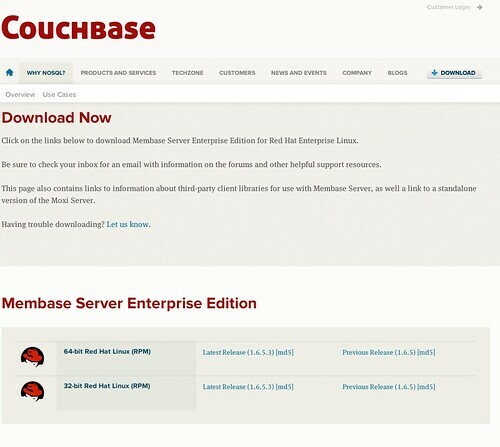 Getting started guide, Couchbase website.